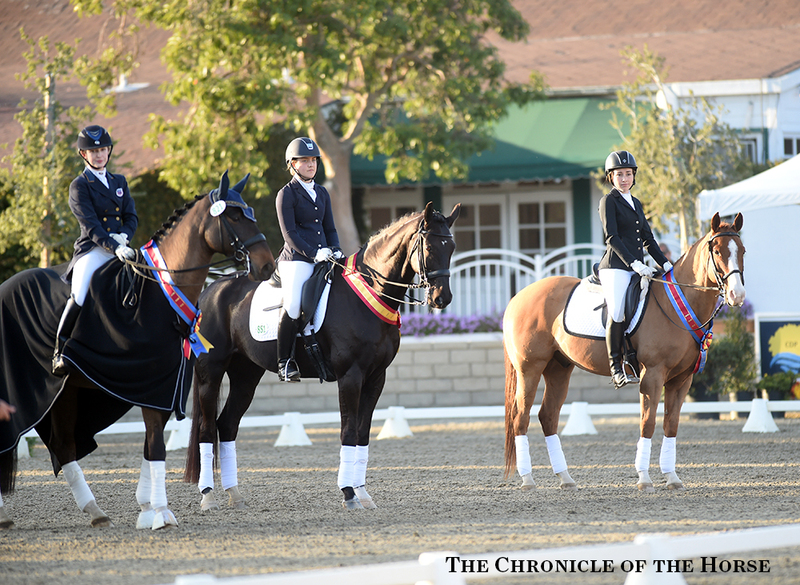 In the sea of huge warmbloods, all with equally huge gaits, at the Burbank CDI, Reagan stands out. He’s small—somewhere between 14.3 and 15 hands—and he’s a sturdy chestnut with white socks and a white face. He’s also a Quarter Horse who spent the first several years of his life under saddle learning the ropes of the reining world. But stand out as he may, Reagan belongs here. Friday he topped the FEI Junior Team test with Francesca Sheld aboard, and Saturday the pair also won the FEI Junior Individual test with 64.76 perecent. USEF Assistant Youth Dressage Coach Charlotte Bredahl-Baker has dabbled in reining and cutting herself, and she went to get some practice at a ranch in New Cuyama, Calif., several years ago. The ranch had purchased Reygun (Dual Rey—Whim Gin, Gin Smokee) when he was 2, and they had high hopes for him as a reining horse or reined cow horse. But he wasn’t working out for the discipline. The owners tried gelding him in hopes that he’d settle down, and when that didn’t work, they gave Bredahl-Baker a call. They asked if she’d take him and see if he’d work as a dressage horse for children. Bredahl-Baker, who’d initially thought the gelding’s name was Reagan, changed it to that. And with time and training, Reagan settled down. Bredahl-Baker slowly trained him up to third level, and then she taught him all the movements in the Prix St. Georges and piaffe. Now, five years later and at 12, he’s learning one-tempis and some passage. In addition to riding him herself, Bredahl-Baker started teaching some of her advanced students on him. Then Sheld came along about two years ago. Sheld’s goal since she was 11 was to compete in the FEI Junior tests and qualify for the North American Junior and Young Rider Championships. 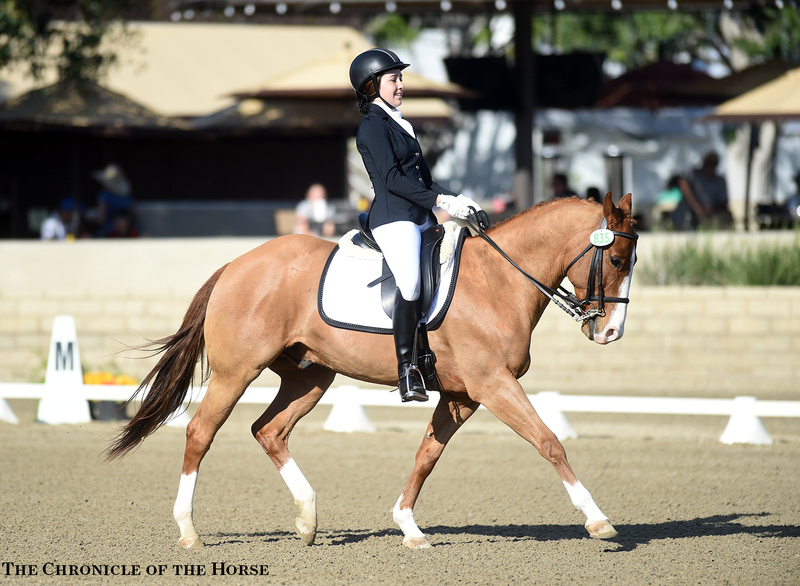 This is the second CDI for Sheld and Reagan; they also contested the L.A. Winter CDI at this facility almost a month ago, winning the FEI Junior Team and Junior Individual tests. An error in their first test at this show bumped their score down a bit (61.43%), but Sheld is just thrilled for the experience. Sheld, 18, is a senior in high school with plans on attending college in Oregon for nursing next year. She knows she’ll likely take a break from competing then, though she wants to help with a therapeutic riding program in her spare time. Until then she’ll keep riding Reagan and learning with him. “As far as learning to become a better rider, I think the horses that don’t have tons of natural gifts or gaits, they actually teach you more,” said Bredahl-Baker. “So it’s been a fun journey. Francesca has been great. She loves him, and he loves her. This entry was posted on Monday, March 21st, 2016 at 2:12 am	and is filed under Uncategorized. You can follow any responses to this entry through the RSS 2.0 feed. Both comments and pings are currently closed.